Pictured left to right: Bailee Otto, eighth grade, from Our Lady of Mt. Carmel; Joseph Messina, seventh grade, from Epiphany of Our Lord; Faith Betteridge, fifth grade, from Sacred Heart of Jesus; Ms. Cody; Mia Messina, fifth grade, Epiphany of Our Lord; and Marisa Coco, eighth grade, Stella Maris. School mergers can be tricky. It can be touch and go, with perhaps many families taking the merger as their cue to leave the Catholics schools, or even move from the neighborhood. 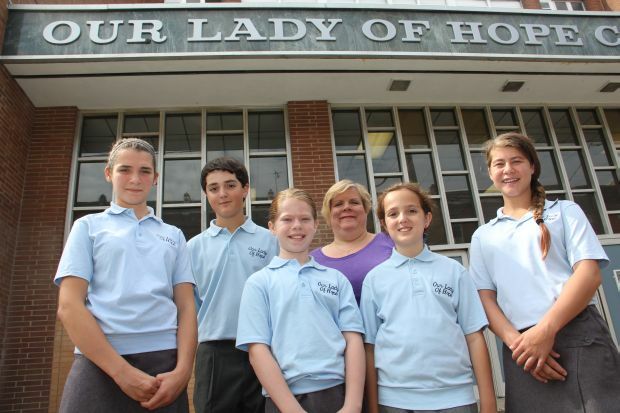 In South Philadelphia, Our Lady of Hope Regional School, which opened last year primarily for children from Epiphany, Our Lady of Mount Carmel, Sacred Heart, St. Philip Neri and Stella Maris at the former Epiphany School, seems to have transitioned nicely. “We will have approximately 390 students, grades K through eight, and we have 20 to 22 children to a classroom with two classes for every grade,” said Patricia Cody, principal at Our Lady of Hope, a position she held at the former Epiphany. Up through grade five the students follow the typical elementary school schedule, remaining in place for virtually the entire schedule. Grades six through eight follow what Cody calls an Academy program. The students do have a home room but they cycle through six classrooms over the course of the day for specific subjects. There is also a very strong list of extracurricular activities, too, the principal noted. Among these are a newspaper, a writing club, liturgical club, technology club, film club, intramural sports and junior varsity sports. Thanks to the Connelly Foundation, there is a very strong arts program that even includes dancing, Cody said. Because Our Lady of Hope is no longer a parish school, it is very much on its own in matters of governance and finances. Gillespie has three children in school — Madeline in grade six, Abigail in grade two and Grace in pre-K. The family lives in St. Philip Neri Parish, and before the consolidation their school would have been Sacred Heart. Bailee Otto, who is going into grade eight, attended Our Lady of Mount Carmel through grade six. For her, last year’s transition was not difficult and she was a member of Student Council in grade seven. Marissa Coco is also entering eighth grade and was a student council member last year. She previously attended Stella Maris School.